80 Wooster Street. Photo: Richard Kostelanetz, SoHo: The Rise and Fall of an Artists' Colony. West of 10th Avenue on 22nd Street sits a long row of trees with stone columns next to each one, an odd touch of nature in the former manufacturing district. Lindsay Pollock recently explained on her blog that they were planted in two sets by Dia (five in 1988 and another eighteen in 1996) as part of Joseph Beuys's 7,000 Eichen (7,000 Oaks), which began at Document VII in 1982. It turns out that Fluxus mastermind George Maciunas is responsible for the Wooster Street trees and that they were a small component of an artist co-op empire that he ran in the area in the 1960's and 70's. George Maciunas, Informational leaflet showing developed and projected Fluxhouses, circa 1967. Courtesy Gilbert and Lila Silverman Collection, Detroit. 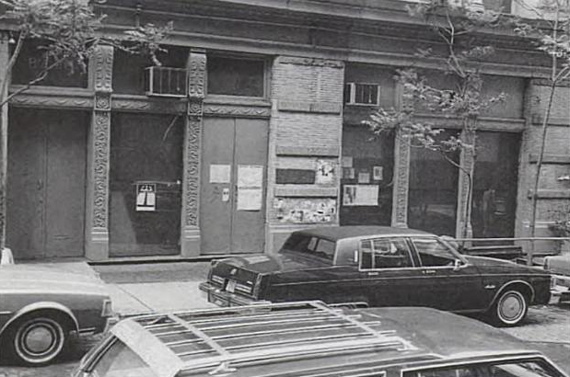 In SoHo: The Rise and Fall of an Artists' Colony, which I discovered through the magic of Google Books, author Richard Kostelanetz explains that Maciunas discovered the trees on the sidewalk of an abandoned parking lot and planted them at 80 Wooster without the permission of the city government. When police showed up, demanding that they be removed, Jonas Mekas reportedly told them, "No, George is not going to do it. He says you have to do it." Maciunas had ordered Mekas to photograph the destruction. The police left and never returned, not knowing that Maciunas was using the trees to conceal a renegade connection to the Con Ed electrical grid. 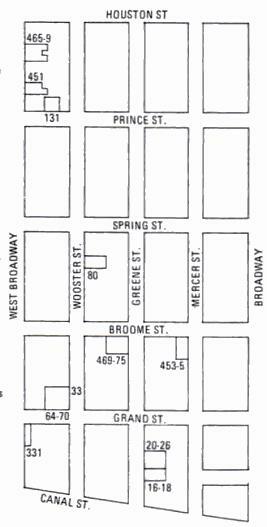 Wooster Street became the center of a series of co-ops (Fluxhouses) that he was quickly developing for artists in the area. Maciunas scoured the neighborhood looking for owners hoping to sell, tossed down deposits, and then rushed to line up investors to win spaces. The risky plays worked; as evidenced by the map included in a 1967 leaflet about his activities, he was able to build up a formidable array of holdings. Other great Maciunas stories in SoHo include: the time he chased away city building inspectors with a samurai sword, the period he spent ensconced in his apartment until 5:00 pm each day to avoid an arrest warrant, and the stretch he spent bathing in an industrial batter mixer purchased from a local baker.